Savory white burger grilled atop thick cut pita bread with roasted red peppers, marinated sundried tomatoes, ripe olives and crumbled feta cheese. CHAR GRILL: Preheat char grill. Place frozen patties on hot grill. Cook for a total of approximately 18 minutes, turning 3 times. FLAT TOP: Preheat flat top grill to 350°F. Place frozen patties on grill. Grill for total of approximately 14 minutes, flipping three times. Always cook to well-done, 165°F as measured by a meat thermometer. Cut the pita in half and grill until the pita opens. 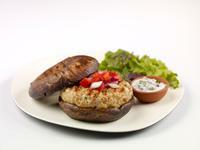 Place the cooked burger inside one pita half with the roasted red pepper and sundried tomatoes. Reserve remaining pita half. Garnish with the cheese and olives.